We put the ECO in Eco-Chic! We put the CHIC in Eco-Chic! 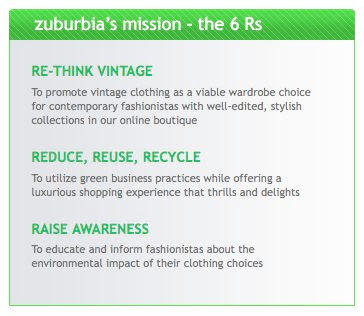 You won’t have to sacrifice one ounce of style to be a good green citizen. Each of our garments is hand-selected for its quality and uniqueness so you can stop swimming in the Sea of Similarity and boldly go where all great fashionistas have gone–a world where LESS is more. Where one item that expresses your authentic self is preferable to a closet full of the ho-hum. Where every item is an endangered species and perhaps the last of its kind to walk the planet. I believe we can be green and not give up an ounce of glam/chic! I love to shop the vintage shops-and especially the great shows. Manhattan Vintage Clothing Show is coming up at the Metropolitan in NYC Oct 9-10, 2009. I love the show and shopping all of my favorite top quality dealers-coast to coast-in one venue-and all of that vintage fashion for a fraction of what it costs-for my wallet and the planet-to purchase designer fashion new. Their website, manhattanvintage.com , shows highlights of the past shows-so you can see the incredible fashion available there-and get a discount coupon at the site good for the 2 day show! Oh-and if you bring your blackberry-show them the screen and they do not make you print it-no wasted paper or ink! Recycled fashion-green at its finest!